Learn to make origami objects like flowers. People new to paper folding often wonder how to make origami things with their newfound skills. Luckily, making things using origami skills is easy once you've mastered the basics. Origami figures are made using precise creases and folds in paper or another medium that result in objects for decoration, play or use in the home. The type of objects or figures you make depends on the purpose you want them to serve. Sometimes, you just want a distraction from work. Other times, you may want to create a holiday decoration. Make origami objects that you can put to use or that you enjoy creating. Decoration: Learn how to make origami photo frames or put together an origami flower bouquet. During the holidays, use decorative papers to create Santa figures, Christmas trees or wreaths. Correspondence: Make an easy origami envelope for all those cards that are missing envelopes. Create pop-up cards using origami animal figures. Toys: Create airplanes, origami animals, boats, pinwheels, vehicles or even doll house furniture using origami techniques. Teach origami for kids to youngsters so they can learn to make their own playthings. Practical Functions: Use origami box patterns to create small jewelry boxes or gift packaging. Cups, vases, CD cases and pencil holders are more practical and functional uses for origami. Use discarded or practice figures as padding in moving boxes or gifts. 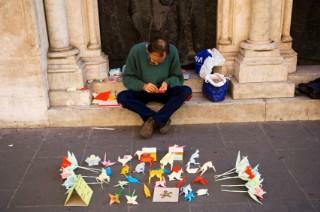 The material you use to make origami things is not limited to origami paper, although that is a commonly used medium. Create origami using fabric, towels, business cards, wrapping paper, tissue paper, and even money. Anything that folds can usually be made into an origami figure. Start with a rectangular sheet of paper. Turn it so it is horizontal. Fold the bottom left corner up until it meets the top edge of the paper. Carefully line up the top and side edges so the folded portion forms a triangle. Use a small paper clip to hold the folded edge in place. 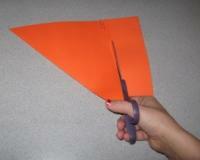 Cut off the excess paper that is not used in the triangle shape. Smooth out the crease before you begin making an origami figure. It is very important to make sure the edges are lined up before cutting the paper. If there is even a slight discrepancy, it can make following origami folding instructions difficult. To make origami things, you need to know how to make basic creases and folds. Simple origami objects are usually the best place to start. Once you become an expert at making easy projects, you can move onto making origami items that require wet-folding or modular designs. Find online origami diagrams or video clips to help you make new things. Pick up specialty origami papers and a book or two once you have decided if you enjoy paper folding enough to invest a little money in the craft.